To be perfectly frank, I can never decide how helpful dryer balls actually are. I still use them—though I honestly don't think they reduce static cling in the slightest, I do think they help prevent wet clothes (and sheets—damn you, sheets!) from sticking together. 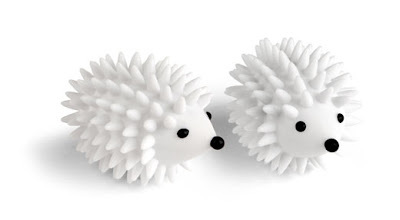 So I naturally found these hedgehog dryer balls enchanting. Very cute + at least somewhat functional = ideal stocking stuffer.